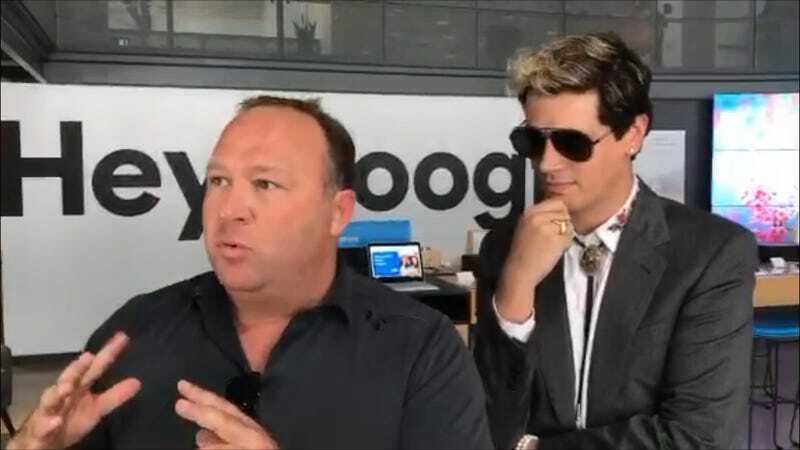 Conspiracy kingpin and Infowars huckster Alex Jones tried to “storm” the Google Fiber offices in Austin on Monday, which essentially entailed entering the building and babbling about a “big AI supermachine” before being asked to leave by Google Fiber staff and the police. Jones is well-known in the city as a sort of regional nuisance and sideshow curiosity, and so was immediately identified by an employee and asked to leave. However, staff do not seem to have recognized a bleached-blonde sidekick accompanying him. Jones attempted to identify the individual with him as “Milo,” who a cursory scan suggests to be some sort of obscure quack remedy sales intern, to no avail. “I don’t keep up with this,” the staffer replied. Eventually, another Google Fiber staffer approached the duo as police arrived and quickly succeeded in escorting him out the front door. Jones may not have cracked the lid off of any Google conspiracies or successfully wasted more than a few minutes of police resources, but it was probably a welcome if brief distraction from the multiple ongoing lawsuits brought by people suing him and Infowars for allegedly defaming them as nefarious deep state agents or misidentifying them as mass shooting suspects. The mystery of who exactly his bumbling sidekick is, though, could ultimately be one of those unresolved questions that just slowly fade away into the dustbin of history. And you know what? Something tells us that’s probably for the best. Gizmodo has reached out to Google for comment, and we’ll update this post if we hear back.